This is a perfect multi-cultural children’s book for our multi-cultural world. The main character Juana needs to learn English for her trip to the USA, and resists it. The story is sprinkled with Spanish terms that are easily recognizable by English-only readers. 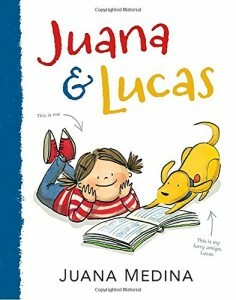 The unique aspect of this children’s book is that it works in two ways – it is a sympathetic book for Spanish-speaking children who are struggling to learn English, and it is a lovely book for English-speaking children to gain empathy for their immigrant friends. The writing is simple, clear, and in very nice large print. There are amble illustrations on each page to make the children’s book more accessible to newly-independent readers. It is categorized as a first-chapter book, but I think it’s complexity might be too difficult for very new, second-grade readers. It can easily be read and enjoyed by third-graders, and could be a very fun read-aloud for anyone younger. I loved the way Juana tells her own story, giving us a glimpse into a bit of her life in Bogota, and her family. I hope this children’s book finds its way into many school libraries, classrooms, and homes.